Usually when we go somewhere we have a plan. We know where we are going, how far we are hiking, what kind of weather to expect, what gear to bring, etc. We decided to take a hike on Thanksgiving but both S and I were feeling non-committal. 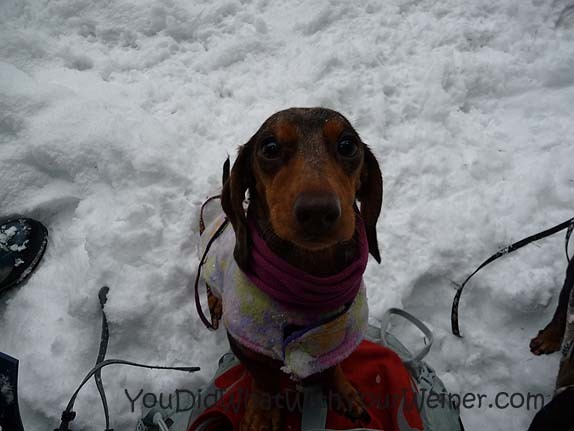 Chester and Gretel didn’t have any suggestions either 🙂 We decided we would head to the mountains not really knowing where we were going or what we were going to do. We thought that whatever we did it would be better than sitting on the couch all day. We knew there would be snow almost anywhere we went so we loaded up warm clothes and snowshoes just in case. We stopped in a little foothills town to get snacks and decided we better have SOME KIND of plan before we continue or we would just end up sitting in the ski resort parking lot staring at each other. The decision is never as hard as we think. I suggested we go one place to play in the snow which reminded S that he had wanted to check out a trail that was near where I suggested. Our ideas snowballed into snowshoeing 4 miles to Franklin Falls and back. We were kind of bummed out that it was raining slush when we got to the trailhead. Chester and Gretel particularly found this to be disagreeable. We headed out anyway. Once we climbed up a little farther into the woods, it stopped raining the air turned dry and crisp. The trail wasn’t as easy going as our last snowshoe . The trail was covered with about 18 inches of snow. A couple of People had walked on the trail recently but their feet only punched holes in the snow. There was no nicely packed trail like on our last hike. It made the ground uneven and left a lot of snow that the dogs had to walk and hop through. They didn’t hesitate though. They are such go getters. We walked for what seemed like it could have been almost two miles. We saw a small waterfall but were disappointed that it didn’t look as cool as it did in the pictures we had seen. The photos we remembered were taken from the base of the falls and there seemed to be no way down there. It also looked much bigger. The trail did look like it went on from where we were but it wasn’t as well-traveled. It was late in the afternoon and starting to get dark so we headed back. When we got back to the house, S looked up Franklin Falls. It turns out that we never even got to the real falls! The real falls are 70 feet high and you can walk right up to the base of them. We THOUGHT something hadn’t seemed right. Chester that sure does look like fun!! I like you guys! You are go getters and tough little dogs!! Ooooooh, can’t wait to see photos of that! Hey, I was wondering if you or the doggies where bear bells when you’re out for your hikes. We don’t. It’s not common to run into bears here. All we have is black bears anyway and they tend to shy away from people (unless you make them feel trapped on get in between them and their cubs)). In all of the years I have been hiking I have only encountered bears in National Parks where the dogs can’t hike anyway. I remember when bear bells were popular here but hardly anyone uses them anymore. If I was hiking where there were Grizzlies I might carry one. 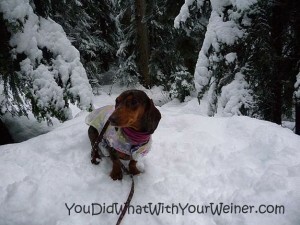 Dachshunds are professionals when it comes to snow!! You should know 🙂 I bet penny picks up snowballs with her long hair. Chester sure did a great job in that deep snow. I guess you have a good excuse to go back! I love reading about adventurous people and their dogs! My friend has 8 dogs, 5 of whom are miniature dachshunds. Those little guys are amazing. She and I live on a trail network that almost no one else uses yet those little dogs bulldoze through huge snowfalls. I love their spirit!!!! It sounds like your pups have similar spirits! 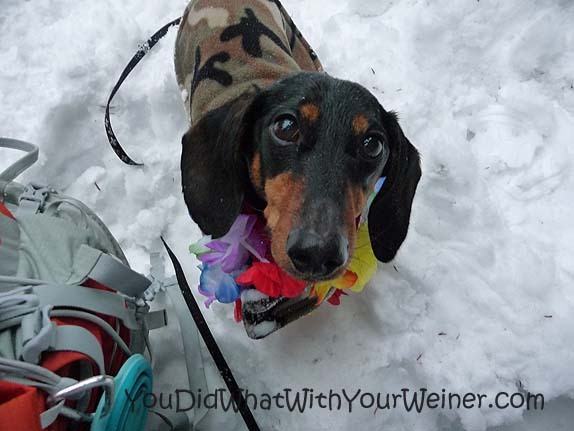 Ahhhh…no wonder the path stays packed down….5 weiner dogs! Ha, ha. I don’t think we could handle 5, let alone 8 dogs total 🙂 Chester and Gretel just plow through the snow like it is no there. When it is really deep (in other words 12 – 18 inches because that is about how tall they are) and powdery, they get tired after about 2 miles though. Thanks for stopping by! Happy Tails and Trails! Chester sure does make it seem easy to hike in the snow!! Hi! I wanted to let you know how much I love you blog. So much so that I gave you the Leibster Blog Award. Feel free to check it out at http://all-things-shih-tzu.blogspot.com/2011/12/leibster-award-yeah.html. Go getters for sure! Trooper! I love hearing the crunch of the snowshoes. We are finally getting a little snow! Yay!